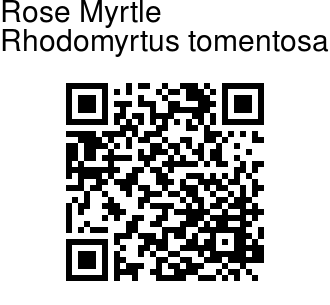 Rose Myrtle is an evergreen shrub growing up to 4 m-12 feet tall. The leaves are opposite, oval, leathery, 5-7 cm long and 2-3.5 cm broad, three-veined from the base, blunt to sharp pointed at the tip, glossy green above, densely grey or rarely yellowish-hairy beneath, with a wide stalk and an entire margin. 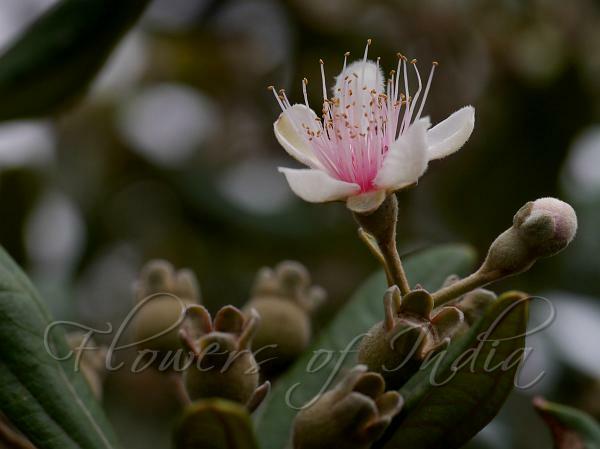 The flowers are solitary or in clusters of two or three, 2.5-3 cm diameter, with five petals which are tinged white outside with purplish-pink or all pink. The fruit is edible, 1.0-1.5 cm long, purple, round, three or four-celled, capped with persistent sepals, soft, with 40-45 seeds in a double row in each cell; seed dispersal is by frugivorous birds and mammals. Seed production and germination rates are high. It has shown promise as a fire retardant species for use in fire breaks in the Himalayas. Identification credit: Dinesh Valke Photographed at Eravilulam National Park, Munnar, Kerala & Sholas, Tamil Nadu.